Cold weather can be dangerous for anyone who enjoys outdoor winter sports and people who work outdoors. Frostbite is the most common injury resulting from exposure to cold, and it usually occurs on fingers, toes, nose, ears, cheeks and chin. If caught early, it is possible to prevent permanent damage, but frostbite can lead to amputation. Superficial frostbite affects the skin surface, while deep frostbite affects all layers. The skin will become numb, blisters may form and eventually the skin tissue dies and turns black. 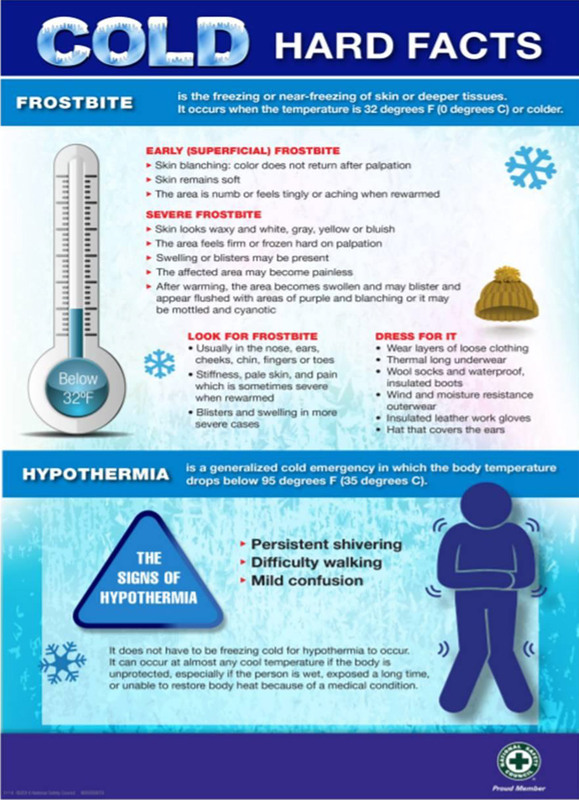 Hypothermia occurs when body temperature drops below 95 degrees. Severe shivering is beneficial in keeping the body warm, but as hypothermia progresses, shivering gives way to drowsiness or exhaustion, confusion, shallow breathing, irregular heartbeat, slurred speech, loss of coordination, unconsciousness and death. Winter is fun. So go make those snow angels and tackle that double black diamond. Just make sure to limit exposure and bundle. If you live in a cold climate, you’re more than aware of hazards that can make winter driving a nightmare, like white-outs, ice-covered roadways and frigid temperatures. Do not warm up your vehicle in a garage – even with the door open – because of the risk of carbon monoxide poisoning; more than 150 people die each year from non-fire related CO poisoning, according to the Consumer Product Safety Commission. Keep your vehicle in top working condition; check ignition, brakes, wiring, hoses and fan belts, spark plugs, battery, tires and antifreeze level before the weather gets bad. You’ve done all you can to prepare, but suddenly you find yourself driving in a slippery mess; if visibility is severely limited due to a whiteout, pull off the road and don’t even attempt to drive until conditions improve. AAA offers a number of suggestions to avoid a skid, like not using cruise control, accelerating and decelerating slowly, and knowing how your antilock brakes work. Always keep an emergency kit in your car.